This study aims to prepare a scaffold complex based on O-hydroxyethyl chitosan (O-HECS) for tissue engineering. The characteristics of the scaffold complex were investigated. Chitosan was made to react with ethylene oxide to obtain water-soluble O-HECS. Body-sealing tube polymerization was conducted with stannous octoate as the catalyst and water-soluble O-HECS as the initiator. D,Llactide ring-opening polymerization was stimulated to prepare water-soluble O-hydroxyethylchitosangrafted polylactic acid (O-HECS-g-PLA). This copolymer was characterized by X-ray diffraction, infrared spectroscopy, scanning electron microscopy and dissolution experiment. A water-soluble OHECS/ polylactic acid copolymer with increased performance was successfully prepared. Water-soluble O-HECS-g-PLA was obtained by chemical modification method. The copolymer has a good mesh structure and porosity and can be used as a drug eluting scaffold. In addition, this copolymer is soluble in certain common organic solvents, which is beneficial for further application in tissue engineering. Chitosan, Scaffold, Polylactic acid, Copolymer. Chitosan (CS) is the deacetyl product of chitin and the only basic polysaccharide that is abundant in nature [1,2]. It has several advantages, such as non-toxicity, non-irritating and good biocompatibility and biodegradability. It can also promote the proliferation and differentiation of certain cells and accelerate tissue formation [3-5]. CS is commonly used in the preparation of medical polymeric materials, delayed-release drug agents and other materials . However, the processing capability of CS is poor and difficult to adjust; its degradation is slow, thereby limiting its development and application . Polylactic acid (PLA) is currently the most commonly used synthetic biopolymer because of its good biocompatibility, desirable mechanical properties, biodegradability and easy processing characteristic. However, PLA is a hydrophobic material [8,9] with poor cell affinity and insufficient functional groups; its degradation products are acidic and could cause an aseptic inflammation response in the body , which is not conducive to cell growth. If the advantages of CS and PLA are combined and their deficiencies resolved, the composite material could effectively improve the mechanical properties to a certain extent. The degradation rate of CS would increase, and the hydrophilicity and cell affinity of PLA could also be improved. The acidic degradation products could likewise be neutralized. Many studies have focused on this field. For instance, Feng and Dong  utilized phthaloyl CS to graft PLA. Luckachan and Pillai  utilized Ti(OBu)4 as the catalyst to synthesize the copolymers of CS and PLA. However, several problems remain. For example, the graft rate of copolymers is low, and the dissolubility of the product in a common organic solvent is not ideal. These problems are due to the high melting point of CS, in which the high-temperature processing causes the thermal decomposition of CS. The compatibility of CS and PLA is poor, resulting in the poor performance of the synthesized materials; the mechanical strength of these materials is reduced . In the current study, the reactive hydroxyl group in CS was utilized to introduce the polar hydrophilic hydroxyethyl group into the CS structure. This procedure increased the water solubility of CS while maintaining the high molecular weight and high degree of deacetylation. Therefore, a neutral water-soluble O-hydroxyethyl CS (O-HECS) was obtained. D, L-lactide ring-opening polymerization was stimulated through body-sealing tube polymerization method with stannous octoate as the catalyst and soluble O-HECS as the macromolecular initiator to prepare a series of copolymers, such as CS-grafted PLA and water-soluble O-HECS-grafted PLA (O-HECS-g-PLA). The composition and structure of these copolymers were analyzed and characterized, focusing on the effects of CS hydroxyethylation on the copolymer grafting rate, structure and performance. A total of 5.0 g CS (molecular weight of 300,000, 90.0% deacetylation; Sinopharm Chemical Reagent Co., Ltd., Shanghai, China) was added into a 250 ml three-neck boiling flask. The pH was adjusted between 12 and 14 with 5% KOH solution. The flask was connected to a reflux condenser, a thermometer and a stirrer and then placed in a water bath at 50°C to 70°C for 48 h to 72 h. When the temperature was increased to 60°C, a total of 11.0 ml aqueous solution of ethylene oxide (Sinopharm Chemical Reagent Co., Ltd., Shanghai, China) was added three times. The reaction was terminated when all the solids were dissolved (the mixture was milk-yellow in color). HCl (5%) was added dropwise into the reaction mixture to adjust the pH to 5 until the mixture became pale yellow in color, clear and transparent. A G3 core funnel was utilized to filter the mixture. The filtrate was concentrated and precipitated with ethanol (the concentrated filtrate was white jelly). The resulting solid was dissolved in distilled water after centrifugation. This process was repeated until no more insoluble solid was found. The final obtained solid was dissolved in water and dialyzed in a big dialysis bag with plenty of water. The dialysate was then lyophilized to obtain the desired final product, which is the resulting solid. D, L-lactide (Shanghai Xitao Industry Co., Ltd., Shanghai, China) and water-soluble O-HECS were added in proportion into single-neck flask at the designed feeding ratio of 10:1, 20:1 and 40:1 for further comparison. Stannous octoate (Foshan Nanhai Jinjia Trade Co., Ltd., Foshan, China) was added at 1/1000 of monomer molar ratio of lactide. The flask was degassed to a vacuum condition and then sealed and placed in an oil heating bath at 130°C for 24 h continuous reaction under magnetic stirring. The resulting crude product was a brown polymer. Acetone was then added to the crude polymerized product. After full stirring, extraction and purification, the resulting solid was dried in a vacuum oven at 40°C. CS-grafted PLA (CS-g-PLA) was prepared through the same method. The graft copolymerization reaction results are shown in Table 1. The graft rates of CS-g-PLA and water-soluble O-HECS-g- PLA increased more than three times with the increase in lactide content. However, the increase in the graft rate of water-soluble O-HECS-g-PLA was significantly higher than that of CS-g-PLA. When the feeding ratio was increased from 10:1 to 40:1, the graft rate of CS-g-PLA and water-soluble O-HECS- g-PLA increased from 22.81% and 73.55% to 109.11% and 361.48%, respectively, thereby indicating that the modified CS significantly improved the reactivity of ring-opening polymerization. aNote: Graft ratio of CS-g-PLA (%) = (copolymer (g) - CS (g)) / CS (g) × 100; Graft ratio of water-soluble O-HECS-g-PLA (%) = (copolymer (g) - HECS (g))/water soluble O-HECS (g) × 100. Table 1. Graft copolymerization results. Figure 1 shows the XRD patterns of CS, water-soluble O-HECS and water-soluble O-HECS-g-PLA. CS exhibited a characteristic diffraction peak at 2θ=20°, indicating that CS acquired high crystallinity because the hydrogen bonds formed by the hydroxyl and amino groups in its molecular chain increased the regularity of the molecular structure; this is also the reason CS was acid-soluble only . By contrast, the diffraction peak of the water-soluble O-HECS was significantly reduced. Figure 1. XRD-ray diffraction patterns of CS (a), water-soluble O-HECS (b) and water-soluble O-HECS-g-PLA (c). The characteristic diffraction peak of the hydroxyethyl group at was found at 2θ=12°, indicating that the hydroxyethyl group (- CH2-CH2-OH) was successfully introduced into the side chain of CS. The peak also indicates that after modification by the hydroxyethyl group, the intramolecular and intermolecular hydrogen bonds of CS were destroyed, causing a significant reduction in its crystallinity, whereas the solubility in water and organic solvents was improved. For the graft copolymer, a weak broad peak was found in the vicinity of 2θ=22.5°, indicating that the diffraction peak at 2θ was subjected to displacement after graft copolymerization. The introduction of PLA further weakened the intramolecular and intermolecular hydrogen bonds of water-soluble O-HECS. The diffraction peak at 2θ gradually weakened with the increase in the number of lactylate units because the introduction of longer PLA into the sugar ring of the graft copolymer results in greater damages to the regularity of the sugar ring structure; thus, crystallinity is reduced. The comparison of the IR spectra of a and c (Figure 2) revealed that the 1070 cm-1 absorption peak became sharp and displacement occurred, indicating that the modification of the hydroxyethyl group occurred in C6-OH instead of C3-OH and the amino group. The 3420 cm-1 absorption peak was the multiple overlapping peak formed by the stretching vibration absorption peaks of O-H and N-H, i.e., the residual hydroxyl and amino groups (or the residual acetamido group) in the residual sugar. This peak reflects the presence of intramolecular and intermolecular hydrogen bonds in the residual hydroxyl and amino groups. Figure 2. IR spectra of CS (a), water-soluble O-HECS-g-PLA (b) and water-soluble O-HECS (c). Comparison of the IR spectra of a, b and c revealed that the υ (C-O) band of the soluble O-HECS significantly changed and that a new peak appeared at 1250 cm-1 (-C-O-C-); the peak of methylene at 2930 cm-1 (-CH2-CH2-) was enhanced. Compared with CS and water-soluble O-HECS, the new stretching vibration absorption peak of C=O at 1760 cm-1 appeared in the copolymer, and the stretching vibration absorption peaks of -CO- C- appeared at 1250 and 1300 cm-1. The peak at 1450 cm-1 in Figure 2 is attributed to methyl asymmetric deformation and that at 1070 cm-1 corresponds to the C-CH3 stretching vibration. Figure 3 shows the SEM image of the water-soluble O-HECS-g- PLA. The image clearly shows that the polymer has high porosity. The pore diameter is 150 μm to 300 μm, with a uniform distribution. A 3D plate-shaped structure was found among the pores. Figure 3. SEM spectrum of water-soluble O-HECS-g-PLA. The solubility of CS, water-soluble O-HECS and water-soluble O-HECS-g-PLA in common organic solvents is shown in Table 2. CS is difficult to dissolve in water, acetone, toluene, dimethyl sulfoxide, chloroform and dimethyl fumarate. The water-soluble O-HECS and O-HECS-g-PLA exhibited relatively better solubility. The water-soluble O-HECS-g-PLA can be dissolved well in dimethyl sulfoxide, with swelling in water, acetone, toluene, chloroform and dimethyl fumarate. The solubility of O-HECS and O-HECS-g-PLA was obviously superior to that of CS. Table 2. Results of solubility experiment. Through the hydroxyethyl modification of CS and the use of ethylene oxide as a coupling agent, D,L-lactide was connected to the corresponding hydroxyl and amino groups in CS. Water-soluble O-HECS-g-PLA was then successfully prepared. The reaction conditions were investigated, and the water-soluble O-HECS- g-PLA was characterized and analyzed. Freeze-drying technology was employed during the preparation of the water-soluble O-HECS-g-PLA. Given that the materials were not affected by the surface tension of water, the product maintained its original shape and did not exhibit any deformation. Therefore, the physicochemical properties were retained and were unaffected by the experimental conditions. O-HECS-g- PLA was prepared by bulk polymerization; thus, the resulting product has good purity and electrical performance. The temperature was strictly controlled (130°C) in the reaction process, thereby reducing the decomposition of CS and increasing the yield and graft ratio. After preparing water-soluble O-HECS by the activation of CS with ethylene oxide, stannous octoate was used as the catalyst to synthesize the water-soluble O-HECS-g-PLA. The graft rate improved significantly and became three times higher than that before hydroxyethylation. This phenomenon could be due to intermolecular hydrogen bonding and stereo-specific blockade inside CS that caused low activity; the introduction of the hydroxyethyl group damaged the intermolecular hydrogen bonding and exposed the active sites on the sugar ring. The graft ratio improved significantly by increasing the feeding concentration of lactide. Therefore, control of the lactide content can effectively adjust the graft ratio of the product. The XRD analysis shows that CS has high crystallinity. 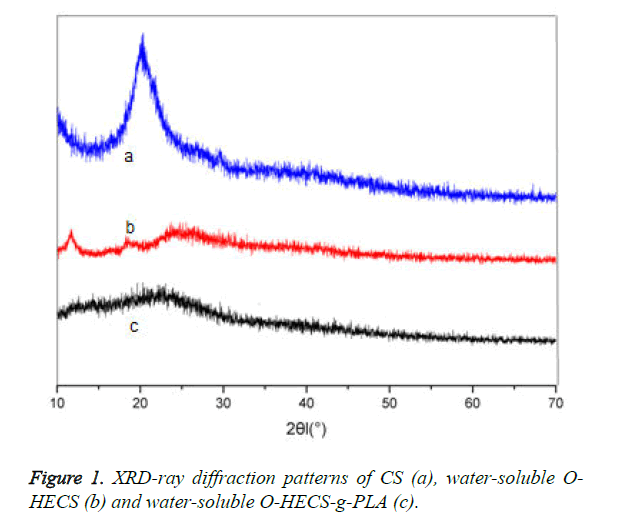 However, after modification with the hydroxyethyl group, crystallinity decreased significantly, which helped improve the solubility of CS in water and organic solvents. The crystallinity of the PLA grafting copolymer decreased, resulting in the significant improvement of the copolymer graft ratio and the solubility of the product in common organic solvents. The IR spectrum test shows that the hydroxyethyl modification of CS occurred at C6-OH. This result indicates that the hydroxyethyl group was grafted on the CS chain. A new C=O stretching vibration absorption peak was found at 1760 cm-1, and -C-O-C- peaks appeared at 1250 and 1300 cm-1. This finding indicates that the PLA side chain was successfully grafted on the sugar ring. The SEM spectrum indicates that the polymer has high porosity and provides sufficient 3D space to repair the damages in the articular cartilage in tissue engineering. The polymer not only maintained the shape and phenotype of the cells growing on the bracket but also promoted cell adhesion, proliferation and even differentiation, thereby inducing tissue regeneration and providing a suitable external environment for cell growth [15-17]. Furthermore, the prepared water-soluble O-HECS-g-PLA has a connective hole shape and sufficient surface area, suitable surface physicochemical properties and good cellular interface. The pore size distribution is relatively close and uniform and can be processed into a desired 2D or 3D structure to provide sufficient space for extracellular matrix regeneration [18-20]. The dissolution performance experiment shows that water-soluble O-HECS-g-PLA exhibits good solubility. Such observation indicates that this product has good biological compatibility, which is very beneficial to its application in cartilage tissue engineering. CS and PLA are biomedical materials with good biocompatibility and biodegradability. In this study, water-soluble O-HECS-g-PLA was prepared by graft copolymerization, which maximizes the advantages of the two materials and resolves the disadvantages of each. Further research on the application of water-soluble O-HECS-g-PLA should consider the following aspects. 1. Ethylene oxide is toxic, flammable and explosive. The chemical property of stannous octoate is very unstable. Stannous octoate is easily oxidized and has toxic effects on the human body. For example, it affects the eyes, skin, mucosa and upper respiratory tract. The amount of residues of these two substances in the product could be determined as well as the damage they may cause to the body during metabolism and degradation. Further studies with long-term follow-up and observation during late cytotoxicity are recommended. 2. Given the limited experimental condition and equipment, other similar products were not produced for comparison in this study. Therefore, data on flexion, extension and impulse strength were not obtained. The performance of this product could not be fully evaluated; further confirmation is necessary. 3. The graft ratio of water-soluble O-HECS-g-PLA increased with the increase in the lactide content. Porosity and solubility also improved significantly. However, whether the mechanical properties and thermal performance were also improved requires further research. Water-soluble O-HECS-g-PLA was finally obtained after long-term repeated experiments under good experimental conditions. The product was analyzed by IR, XRD, SEM and solubility test. The results showed that the hydroxyethyl group-modified O-HECS significantly improved solubility and ring-opening polymerization reactivity and reduced the crystallinity and hydrogen bonding interactions of CS. The graft ratio also improved, thereby providing favorable conditions for successful reaction with lactide to obtain the water-soluble O-HECS- g-PLA. The water-soluble O-HECS-g-PLA has a good mesh structure and porosity, thereby providing a good structure for future medical applications. In addition, the solubility of the water-soluble O-HECS-g-PLA in common organic solvents was significantly improved, thereby revealing its potential application in tissue engineering. This study was supported by Jiangxi Provincial Natural Science Foundation (20114BAB205045). Chenite A, Chaput C, Wang D, Combes C, Buschmann MD, Hoemann CD, Leroux JC, Atkinson BL, Binette F, Selmani A. Novel injectable neutral solutions of chitosan form biodegradable gels in situ. Biomaterials 2000; 21: 2155-2161. Di Martino A, Sittinger M, Risbud MV. Chitosan: a versatile biopolymer for orthopaedic tissue-engineering. Biomaterials 2005; 26: 5983-5990. Kweon DK, Song SB, Park YY. Preparation of water-soluble chitosan/heparin complex and its application as wound healing accelerator. Biomaterials 2003; 24: 1595-601. Yamaguchi I, Itoh S, Suzuki M, Sakane M, Osaka A, Tanaka J. The chitosan prepared from crab tendon I: the characterization and the mechanical properties. Biomaterials 2003; 24: 2031-2036. Wang LY, Ma GH, Su ZG. Preparation of uniform sized chitosan microspheres by membrane emulsification technique and application as a carrier of protein drug. J Control Release 2005; 106: 62-75. Kim SE, Park JH, Cho YW, Chung H, Jeong SY, Lee EB, Kwon IC. Porous chitosan scaffold containing microspheres loaded with transforming growth factor-beta1: implications for cartilage tissue engineering. J Control Release 2003; 91: 365-374. Hasirci V, Lewandrowski K, Gresser JD, Wise DL, Trantolo DJ. Versatility of biodegradable biopolymers: degradability and an in vivo application. J Biotechnol 2001; 86: 135-150. Lee NK, Oh HJ, Hong CM, Suh H, Hong SH. Comparison of the Synthetic Biodegradable Polymers, Polylactide (PLA), and Polylactic-co-glycolic acid (PLGA) as Scaffolds for Artificial Cartilage. Biotechnol Bioprocess Eng 2009; 14: 180-186. Lasprilla AJ, Martinez GA, Lunelli BH, Jardini AL, Filho RM. Poly-lactic acid synthesis for application in biomedical devices - a review. BiotechnolAdv 2012; 30: 321-328. Coimbra P, Ferreira P, de Sousa HC, Batista P, Rodrigues MA, Correia IJ, Gil MH. Preparation and chemical and biological characterization of a pectin/chitosan polyelectrolyte complex scaffold for possible bone tissue engineering applications. Int J BiolMacromol 2011; 48: 112-118. Feng H, Dong CM. Preparation, characterization, and self-assembled properties of biodegradable chitosan-poly(L-lactide) hybrid amphiphiles. Biomacromol 2006; 7: 3069-3075. Luckachan GE, Pillai CKS. Biodegradable Polymers- A Review on Recent Trends and Emerging Perspectives. J Polymer Environ 2011; 19: 637-676. Hong Y, Gong Y, Gao C, Shen J. Collagen-coated polylactidemicrocarriers/chitosan hydrogel composite: injectable scaffold for cartilage regeneration. J Biomed Mater Res A 2008; 85: 628-637. Cervantes TM, Bassett EK, Tseng A, Kimura A, Roscioli N, Randolph MA, Vacanti JP, Hadlock TA, Gupta R, Pomerantseva I, Sundback CA. Design of composite scaffolds and three-dimensional shape analysis for tissue-engineered ear. J R Soc Interface 2013; 10: 20130413. Yang Q, Peng J, Guo Q, Huang J, Zhang L, Yao J, Yang F, Wang S, Xu W, Wang A, Lu S. A cartilage ECM-derived 3-D porous acellular matrix scaffold for in vivo cartilage tissue engineering with PKH26-labeled chondrogenic bone marrow-derived mesenchymal stem cells. Biomaterials 2008; 29: 2378-2387. Gong Z, Xiong H, Long X, Wei L, Li J, Wu Y, Lin Z. Use of synovium-derived stromal cells and chitosan/collagen type I scaffolds for cartilage tissue engineering. Biomed Mater 2010; 5: 055005. Wang Y, Bella E, Lee CS, Migliaresi C, Pelcastre L, Schwartz Z, Boyan BD, Motta A. The synergistic effects of 3-D porous silk fibroin matrix scaffold properties and hydrodynamic environment in cartilage tissue regeneration. Biomaterials 2010; 31: 4672-4681. Peesan M, Supapho P, Rujiravanit R. Preparation and Characterization of hexanoyl chitosan/polylactide blend films. Carbohyd Poly 2005; 60: 343-350. Wan Y, Wu H, Yu A, Wen D. Biodegradable Poly lactide/Chitosan Blend Membranes. Biomacromol 2006; 7: 1362-1372. Danisovic L, Varga I, Zamborsky R, Böhmer D. The tissue engineering of articular cartilage: cells, scaffolds and stimulating factors. ExpBiol Med (Maywood) 2012; 237: 10-17.